With a windfall of new members in 2011, credit unions should spending 2012 ensuring those members will be valuable. Credit unions are always interested in tracking their new member growth and perhaps no quarter was as anticipated as the fourth quarter of this year. Much of that focus can be attributed to Bank Transfer Day, which occurred on November 5. Would the hoopla created by the media actually be met with increased activity at credit unions? According to 6,455 credit unions reporting data in First Look (representing 88% of total credit unions), the answer, it seems, is yes. 670,760 new members joined these credit unions in the fourth quarter. 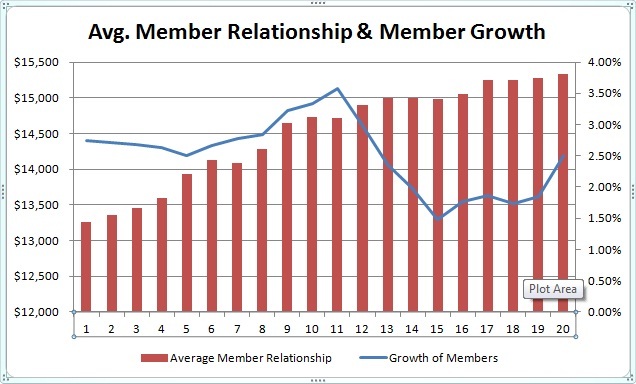 Annual growth of members is at 2.5%, up from 1.8% in the third quarter of 2011. While a growing member base is important, member relationships are even more important. Credit unions need to get their members engaged and taking advantage of an array of services. Having a member open a share draft or checking account and establish a direct deposit into the account helps lay the groundwork for a long-lasting profitable relationship. To go along with the increase in members, share draft penetration, the percentage of members with a share account, also increased. It reached a new high of 49.9%, up from 49.2% in September. It is a safe assumption, given the momentum credit unions are having, that credit unions will deliver share drafts to over half their members for the first time as early as next quarter. Source: Callahan & Associates' Peer-to-Peer data. Perhaps an even more positive measure is the fact that share draft accounts grew at an annual rate of 6.1%, more than twice the rate of new member growth. Not only are new members joining, but current members are now bringing more of their money over to credit unions. This is good news all around. The average member relationship grew by 35 basis points from the third quarter of this year, from $15,279 to $15,332. This measures the how much the average member is taking advantage of the share and loan opportunities offered by the credit union. Credit unions have ramped up promotion on what sets them apart from banks, and it seems that the public is taking notice. 2012 has the potential to be even better than 2011, provided that credit unions turn this new member base into lifetime customers. How Do You Solve A Problem Like Deposits? I have been working with credit unions since 2003. I find that credit unions do a good job of attracting new members, but don't really do a good job at cross selling other services. Establishing a strong cross sell program in each credit union branch is essential. Good artical for discussion.